I am not a superstitious person. (That sounds a bit like something Richard Nixon once said. Oh, well.) But my rejection of superstition carries an implicit recognition that believing in unseen powers, magical numbers, mystical incantations and portentous utterances can tempt rationality from its stern requisites the way a flashing glance from a cheerleader can test the tensile strength of an altar boys shorts. So, every so often I let myself succumb to it, as if to say, “OK, magical forces of superstition, show me whatcha got. Make me a believer. OK, Lady Luck, kiss my sweet . . . “ well, you know what I mean. What’s to lose, right? You see, ever since I was a lad back in the Mesozoic I have abided a deep and mostly repressed superstition in the lucky penny. 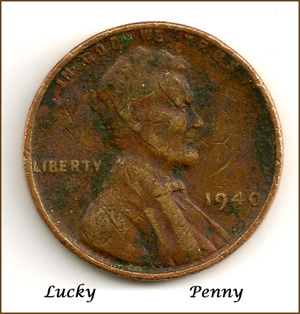 It’s simple and goes like this: if you chance upon a lonely penny (not a bunch of pennies) lying on the ground and stoop to pick it up, your luck will change for the better. That’s a lucky penny. Simple enough. Except when, As I did recently, you stoop to retrieve a hopefully “lucky penny” that was more in the road than beside it, and an oversized SUV driven by an undersized Asian guy with one hand holding a cell phone and the other hand holding God knows what nearly turned my sweet derriere what into road kill. If that doesn’t make you superstitious nothing will. So I compulsively stoop to retrieve every penny I see. Why should I be embarrassed when a woman near the café I frequent looked at me like I was one of those guys who can’t pass a pay phone (if you can find one anymore) and checks to see of someone forget to retrieve their change. I figure that everyone that drops a penny and can’t be bothered to pick it up might be foolish enough to be tossing away their own good luck. Finders keepers, I say. When I was a kid I would have had a lot of competition for the few pennies one might spy on the sidewalk in those days. A penny could get you a string of licorice or a small lollipop. You could even mail a postcard for a penny. These days people seem to just toss them n the street as though they were a nuisance. I’ve seen persons drop a bunch of pennies and just walk away. No wonder the US. Government has to mint nearly 10 billion of them every year. That’s right, 10 billion, with a “B.” That’s about enough for some Wall Street bonuses. Believe it or not there are some people who hate the penny. Like this congressman for Arizona, Rep. Kolbe, who introduced a bill back in 2002 to eliminate the penny. Of course, if you are a congressman from Arizona, this is about as profound a matter as you are likely to be able to handle. But, it must be said that even President Obama has promised to consider the matter, perhaps sending all the pennies to Gitmo. We have all heard someone excuse themselves because they have to “spend a penny.”* Maybe this euphemism came from having to pay a penny to use a public toilet, or purchase some t-p. Having a penny to drop into the cup might be very welcome in a circumstance of “urgent evacuation.” And what about having to cough up a couple of cents to pay Charon, to boatman of the River Styx, to take you across into Hades (this is for those of you who are into classical eschatology). Then, too, what is to become of all the linguistic referents: “penny-ante,” “Pennies from Heaven,” “a penny saved is a penny earned,” people showing up “like a bad penny,” being worth “every penny” you make (unless you’re from Wall Street), or not having a “penny to your name,” (thanks to Wall Street that will probably screw you out of your wealth by selling you worthless “penny stocks”). Students will have no contemporary reference for their encounters with drachma in Greek plays, or the denarius in Roman history (the pennies of their time and the reason that sometimes the penny is represented by the letter “d”), or a “tuppence” from My Fair Lady. But mainly I worry that the day might come when there aren’t any pennies around to distribute good fortune. All those coppers (actually they are mostly zinc) are just going to get melted down weapons or a statue of Rep. Kolbe, when they could be laying out there on sidewalks and in gutters giving “the probability of hope” to those of us who are looking where the hell we are walking. Picking up what we hope are “lucky pennies” is sort of like playing the lottery or the slots for those of us who don’t like the odds of those scams, and who adamantly refuse to contribute to the religious superstition that the favors of the gods require that we pay protection money for “Peter’s Pence,”*** or the intercession of blow-dried televangelists. Unh, uh; we prefer our low-cost, low-carbon, dalliance with superstition and fickle chance. We prefer our lucky pennies. Put in your two cents. **Music by Arthur Johnston; Lyrics by John Burke. From the 1936 movie of the same title. ***The Roman Catholic Church’s annual pay off to the Vatican.